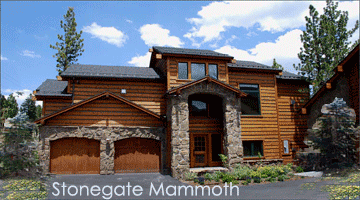 Stonegate in Mammoth is a luxury home development with 14 homes all zoned for legal rentals. They are just the other side of the Village which makes their location... well, you know, location, location, location. The townhomes are rustic log cabin in style and feature beautiful amenities including large open living rooms, smaller dens some with pool tables, and plenty of bathrooms. The homes come in 3 bedroom, loft and dens, 4 bedrooms and 4 b4droom, loft and den which we often call a 5 bedroom model as the lofts inevitably get made into bedrooms. The homes average between 2500 and 3500 square feet, and have 2 car garages. Each Stonegate home is modern mountain luxury with five star amenities. Look for hardwood floors, stainless steel appliances, granite counter tops and open high ceilings. Bedrooms are large many with en suite bathrooms, and depending on size and decor can sleep 8 - 12 people very comfortably. Mammoth Stonegate Homes are 5 star luxury rentals near the Mammoth Village, Pure Pleasure. Stonegate sits on Minaret Road and overlooks the fairways of Sierra Star Golf Course. An easy walk to The Village and you'll find a dozen place to dine, drink wine, or ride the gondola up to Canyon Lodge. Chair 15 at Little Eagle is about 1 mile away and there are shuttles everywhere to take you where you need to go so you don't have to pull the Mercedes SUV out of the garage! A Stonegate rental comes with all the City Concierge amenities set up ready on arrival. You may add daily maid service, a private chef to cook for your or have one of our concierges shop and stock your refrigerator so on arrival you're ready to relax, unwind and settle into Mammoth.